Purpletree Software LLP brings an advanced and comprehensive extension to upload products in bulk for e-commerce portals. Learn more about this extension here! Thanks to the introduction of internet marketplace and E-commerce portals, the way we buy products and services have drastically changed in the last decade. E-commerce portals have made our lives easier and simpler. All you need is a smartphone or laptop, and you can buy all your needs in a few simple clicks.Any e-commerce portal would offer you a lot of products in different categories to be purchased. However, the e-commerce business owners face a lot of difficulties and hard time managing products and services being offered on their portals. They need to stay updated with their stock inventories, sales orders, shipping, payments, vendor management, commission calculation, dispatch and a lot. Uploading new products, updating and exporting product details in bulk on and from e-commerce portals are amongst the biggest challenges faced by e-commerce business owners. This is where Purpletree Software LLP comes as a savior for e-commerce portals. We have developed various advanced and innovative software plug-ins and extensions for your e-commerce website, which will help you managing your e-commerce portal in the best possible way with minimum efforts. The Purpletree product bulk export and import extension (Admin and Seller) is an advanced and comprehensive extension for e-commerce portal, which allows a user or admin to export all products and their data in a single step with an ease. It eliminates the need of long and complex manual data entry steps, which require a lot of time. Opencart multi vendor extension allows the e-commerce portal’s admin to upload the products on a single click without the need of manual entries and data update. 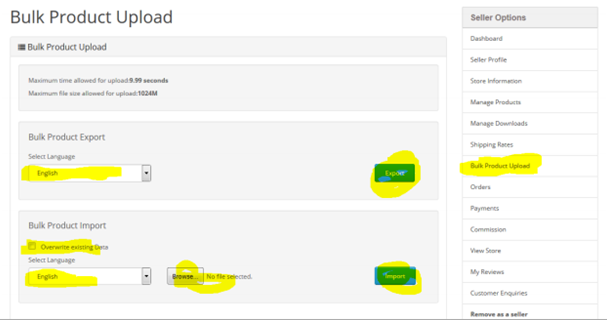 To bulk upload, login to admin portal >> Purpletree Multivendor >> Bulk Product Upload. Admin can import new products data and update the existing product data. Select ‘none’ for admin products. To import, admin can extract the data sheet having 13 tabs which needs to get uploaded. To bulk upload, login to seller portal >> Bulk Product Upload. Seller can import new products data and update the existing product data. Import/export the formatted excel sheet having 13 tabs. With this extension, an opencart multi seller can add a lot of product details or information like its image, quantity, stock available, brand name, manufacturer, availability status, model/type and other relevant details in easy ways. It also supports your SEO practices as you can add meta keywords, meta title, product name and description with seo-friendly keywords. You can also manage product’s price, discount options, categories and other attributes without any hassle. Purpletree Software LLP is an expert e-commerce software solution development company, which offers user-friendly software solutions that aim towards simplifying the day-to-day operational works for e-commerce business portals. It provides a host of software plug-ins and extensions for e-commerce website portals. Therefore, use purpletree software to bulk import/export e-commerce products in a single step! !